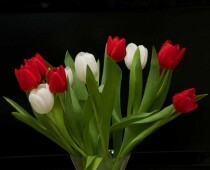 I have seen tulips do that before, and I find it most photogenic! Another angle posted this morning…. I was especially pleased with this one! You caught that just at the right time, Sue.